It’s definitely a controversial topic, if someone talks about Best Biryani. There is nothing called Good or Bad Biryani. It’s all depends on the people who like what! As soon as we hear Biryani in general, Hyderabadi and Awadhi Biryani come to a Mind. So many people don’t know that, there are multiple varieties of Biryani’s in Hyderabad Itself. I have been interacting with a few friends from Hyderabad and they fond of Biryani’s from a couple of legendary joints near Old City; the Biryani preparation and taste is completely different from popular Biryani restaurants in the town. However, when it comes to Awadhi Biryani, there is no much difference in cooking style & taste. There are few more Biryanis like Karnataka Gowda Style Biryani, Kolkata Biryani, Malabar Biryani, Ambur Biryani, Chettinad style Biryani – These are popular only in their cities and most of outsiders will have mixed feelings about it. The Rice & Masala used for Biryani is again differs from place to place & state to state. In few Biryanis, people use long grain basmati rice and high spice level. Whereas, other Biryanis have short Zeera Samba rice with medium spice level! These variations make a lot of difference for the people who have minimum knowledge about the Biryani. It’s not easy to explain and educate this difference to customers from a restaurant. Recently we had come across a new Biryani Place called “Chinnaswamy Naidu Biryani” in HSR Layout, Bangalore. This restaurant serves an authentic Dindigul Style Biryani, which is again different from all the other Biryanis in India. They use Jeera Samba short rice with medium spiced Biryani and the stuffs here we get are aromatic, because of the Chettinad Influence! Also, they use pure ghee to prepare Biryani, which kills the spice level of any dish. Through FBAB Meetup, we happened to visit CNB for a lunch and an exclusive menu was set for us to experience various authentic dishes of Dindigul. First of all, I would like to thank Mr. Lakshmikanth (Manager) for his unconditional hospitality towards us. The restaurant is elegant, bright and catchy interiors without any non-sense stuff! The seating is comfortable for every diner, that’s something mandatory thing, when we go to any restaurant. As I said, they serve authentic Dindigul Cuisine. So there are no other cuisines available on the menu. They are doing an amazing job of not keeping other cuisines. Since, they are expediting only with Dindigul cuisine more than anything. The menu is restricted to Non Veg fare. However, they are coming up with some vegetarian dishes based on patron’s request. A couple of them, including me, got an opportunity to try out the upcoming Veg Dishes on the Menu. We were truly overwhelmed with the dishes served in Veg Fare. Raw Banana Fry – A starter cooked with the perfection by adding few aromatic spices and the spice level was just hitting the throat. A must recommended dish in CNB. Yam Fry – The Yam is rich in minerals and Vitamins. It was a deep fried dish and slightly spiced. It was crispy outside and soft inside. This was a Show stopper for Non Vegetarians too, and presented perfectly by garnishing some fried curry leaves. Tomato Rasam or Soup – They dint had any alternatives in the Veg Version. So they served the Tomato rasam based on our request. It was just awesome with right spice level and tanginess. Paddu or Paniyaram or Goliyappa – Hot Paniyarams were served and these were upright without any complaints. 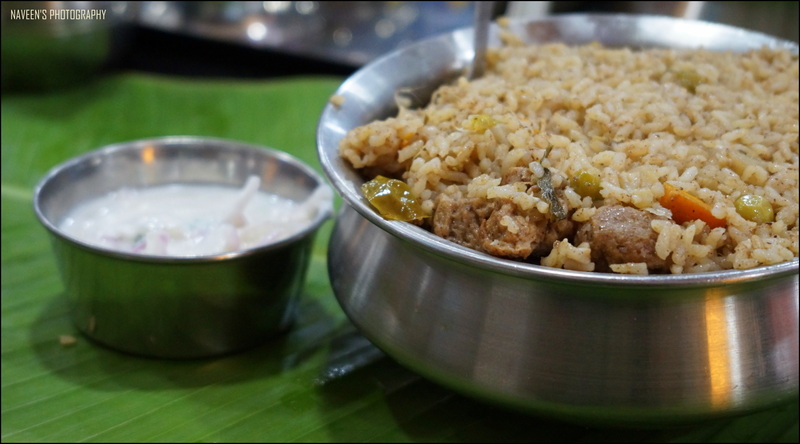 Veg Dindigul Biryani – It was a Dum Biryani made out of Jeera Samba Short rice with Soya Chunks. The Biryani was less spiced. However, more aromatic and Spice flavors just burst after a Bite. That’s a divine feel! Biryani accompanied with Raitha. Brinjal Curry with White Rice – Katrikai or Brinjal based Curry is one of the popular dishes in South India. All the 3 states have their own style of preparation. At CNB, it was unique and goes perfectly with white rice. One must definitely experience this gem kind of a dish! Jil Jil Jilgarthanda – The drink made out of China Grass, Milk, Nannari Syrup and Ice Cream, this drink was totally refreshing and appeals to try another one. An authentic drink originated from Madurai in Tamilnadu. Panai Paagu Thair – The dessert was made from curd and black Jaggery and served in a Kullad. It was another extraordinary one from CNB. It was a different experience all together and I would definitely call it a good restaurant for an authentic Dindigul cuisine in Bangalore. I am sure; the dishes you get here will be difficult to find in other restaurants of the Town. An apt place to go with family and friends! Note: This review is based on Vegetarian Prospective. But our Non Vegetarian friends equally enjoyed the Fare.